TRANSFORM Your HEALTH, Your FITNESS, Your BODY, TRANSFORM Your LIFE. See how our members have transformed their health and consequently their lives. Sign-up to our online programme today & change your life! Are You Ready to TRANSFORM it? My name is Andy Cowling and to look at me now, you’d be forgiven for thinking that I’m one of those lucky people who has managed to stay fit and healthy well into middle age, with an athletic looking physique and my new found interest of competing in natural bodybuilding, but I haven’t always been this way. At the age of 45, I was so riddled with debilitating inflammation that every joint in my body was swollen, stiff and extremely painful, almost rendering me immobile and making everyday tasks very difficult, with the worst symptoms being in the morning, making just getting out of bed a real chore. After several visits to my GP, who prescribed an array of painkillers and NSAIDS (non-steroidal anti-inflammatory drugs) which had little to no affect and also taking several blood tests which proved inconclusive, he finally admitted defeat and suggested I see a Rheumatologist. I opted for a private consultation to hurry things along due to the pain I was in and was subsequently diagnosed with Rheumatoid arthritis. Once diagnosed I returned to the NHS for treatment and after having the diagnosis confirmed by their consultant was prescribed various medications designed to arrest the condition and gain control of the symptoms, all of which left me extremely exhausted, had limited effect on my symptoms and with the feeling of seemingly no hope had a profound effect on me mentally. I spent all my spare time researching the condition, probable causes, possible cures etc. and the one thing that repeatedly cropped up was a possible lifestyle connection, specifically diet. After 18 months of ever increasing doses of highly toxic medication, the odd corticosteroid injection, fortnightly blood tests to monitor how my liver was coping with it all and seeing no significant improvement, I decided to take matters into my own hands. I couldn’t continue living this way so against medical opinion and advice I decided to cease with their treatment, take a more holistic approach and try to contain my condition through lifestyle and dietary means. The diet/lifestyle that kept cropping up during my endless hours of extensive research and the one that I adopted was based around nutrient dense natural wholefoods designed to provide the body with the basic nutrition it needs to function optimally. This coupled with exercise based around more movement in general and short, sharp, intense bursts of cardio and weight/resistance training became a new way of life for me. I ceased with the more toxic drugs almost immediately whilst introducing the diet but continued with the NSAIDS as and when I felt I needed them to combat any inflammation. Over a period of about six weeks I found I required these drugs less often as the inflammation subsided and symptoms improved on a daily basis before finally dispensing with them completely. Even though I had extensively researched the diet over months, reading countless success stories of people regaining their health with similar lifestyle changes, I was still a little surprised at how quickly I noticed positive changes but the general feeling of wellness was compounded by even more dramatic results. I dropped just over 20lb in weight, most of which was body fat, altering my body shape and physique to a more athletic appearance revealing muscle tone I didn’t think was possible for someone of my age and just as surprising was the boost in energy levels I experienced, all this enforced a new found positive mental attitude and for the first time in quite a while I was looking to the future with renewed optimism. In the following months my energy levels, physical appearance and capabilities along with clearer thought patterns continued to improve as I followed my new lifestyle rigidly with very few to none of the symptoms I had previously suffered, the exception being a little joint pain from time to time but nothing too serious or anything I couldn’t handle, until eventually becoming totally symptom free of a disease I was told would be a lifelong condition. Now over seven years on I have no health issues that I know of despite the toxic medication I was prescribed, am very rarely if ever ill except maybe the odd cold during the winter which clears within days and never spreads to my chest, which it previously did, the chronic hay fever that blighted me is a thing of the past and I can’t recall the last time I suffered from any form of headache. Looking back and knowing what I now know I realise my illness was the culmination of a gradual decline in good health, possibly from childhood, certainly from my teenage years and beyond, I can attribute to a lifestyle commonly shared with many if not most people of my generation, although the lifestyle of proceeding generations is far worse and could explain the epidemic of the so called ‘modern diseases’ that now blight society. Once I regained my health and encouraged by the positive change in my physical appearance I began to work harder in the gym and even played football again, to improve my fitness and just because I could. 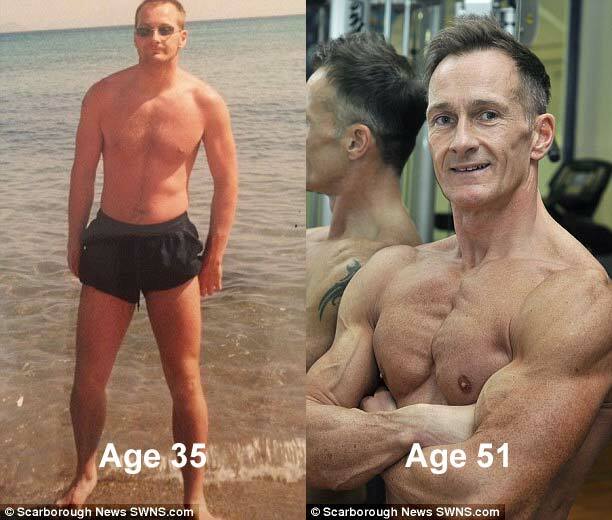 The results from the gym were nothing that I had experienced previously and at nearly fifty years of age I became leaner and more muscular than I had ever been at any time in my life. I believe the dietary change was the main reason for this, providing my body with what it required to heal and then begin to function as it should again. Encouraged by this I began to train harder and built a more muscular physique that didn’t go unnoticed by other gym users, probably due to the results I was getting despite my age and was encouraged to train for and enter the world of natural bodybuilding, something that had never crossed my mind or ever imagined I’d do. At just over fifty years of age I competed in my first competition, the 2016 NPA Yorkshire masters over 50’s and to my surprise came away with the winner’s trophy and an invitation to the NPA Britain finals later that year, where I took a very creditable fourth place. From being ‘crippled’ with Rheumatoid arthritis to becoming a bodybuilding champion and competing on the national stage is some turnaround. I realise bodybuilding is not for everyone and believe me it’s not something I ever envisaged doing but it’s a strangely addictive sport and the healthy lifestyle that must be followed to enable you to be successful is now a way of life for me. What all this demonstrates evidentially to me and what I’ve learnt through my experience is that if the body is provided with what it needs and indeed what it requires nutritionally and not what it doesn’t, it has the potential to heal itself allowing it to function more efficiently and enabling it to respond positively to stimulation through exercise regardless of age. My journey back to good health inspired me to further my education and knowledge of the human body. I am now a qualified Personal trainer with additional qualifications in exercise referral and exercise/nutrition of clients with diabetes and obesity. I wanted to share my experience to hopefully aid other people having issues with health so along with James, implemented a transformation programme at his health & fitness club providing help and support to members wanting to lose weight, alter their body shape, increase fitness levels and improve health markers which could significantly benefit their quality of life. The program has been remarkably successful with every participant who adhered to it achieving extraordinary results during the 12 week period. Members lost large amounts of weight, 50lbs in one case, improved their body shape and composition which subsequently improved their confidence, having a positive effect on their mental attitude but more importantly health markers dramatically improved. Clients with high blood pressure saw levels drop and return to normal in some cases allowing them to reduce or even stop medication with GP approval, symptoms of Diabetes dramatically improved and joint problems/stiffness eased with Rheumatoid arthritis symptoms in one member completely disappearing, just like myself, enabling them to dispense with lifelong medication, again with GP approval. The positive and in some cases dramatic results from the program which may have been somewhat surprising to the participants certainly didn’t surprise me. Having obviously experienced first- hand the benefits of the lifestyle change for myself I had already successfully helped one or two private clients improve their health, as well as unintentionally helping my wife. Although she didn’t suffer with the problems I did she had one or two health related issues that had plagued her for many years, common ailments so many people suffer with that are not seen as anything unusual in the industrialised world. She had been asthmatic since childhood, suffered with eczema mainly to the back of her hands and was diagnosed with IBS in her twenties, all these conditions as with so many ‘modern’ ailments were symptomatically treated with prescribed medication by GP’s with very limited results. We embarked on the dietary change together as it was so much easier planning and preparing meals and just as myself all of her conditions were allayed, she hasn’t had to use an asthma inhaler for a number of years, her IBS is a thing of the past and although she can still get a mild outbreak of eczema on the back of her hands from time to time the problem is nothing compared to previously, also as with myself she lost any excess body fat. I believe many of if not most of these ‘common’ conditions as well as many more lifestyle related diseases are diet induced with one episode in particular demonstrating this to me. Having made the dietary changes some six months previous my wife and I dined out and after not eating pasta since making the changes she chose a pasta dish, something we had consumed regularly previously and in all honesty maybe missed. The following morning my wife awoke with a painful and distended stomach, symptoms of IBS she was all too familiar with but had not suffered from in many months and has not suffered with since, coincidence or maybe evidence IBS could be due to an intolerance to gluten. Mass produced processed food is manufactured for the sole purpose of profit despite clever marketing, which is at the very least misleading, claiming many ‘health’ benefits and in my opinion greatly contributes to ill-health and disease. Through ‘my story’ and the Health Transformers club I wish to offer hope and inspire people to take back responsibility for their own health and wellbeing to improve and sustain their quality of life. I passionately believe through my experience that by changing one’s lifestyle to incorporate a diet that provides essential nutrition for optimal health and reintroducing exercise on a regular basis this can be achieved, give the body what it needs and it can heal itself. ‘Let food be thy medicine and medicine be thy food’ and ‘walking is man’s best medicine’ are quotes attributed to Hippocrates who is widely regarded as and referred to as ‘the father of modern medicine’ whose philosophy was to treat the patient and not just the disease. Through these two quotes he is basically referring to diet and exercise as medicine, the treatment and prevention of disease. One thing is for sure a poor lifestyle will catch up with us all in the end but with proper nutrition and becoming more active on a daily basis it is possible to improve health and consequently one’s quality of life regardless of age or current health issues. Lose weight the safe and natural way and never worry about regaining it by making lifestyle changes that will improve your health, fitness and wellbeing, alter your body composition/shape and improve your quality of life. Simply by following a tried and tested programme of Diet and Exercise that is guaranteed to yield results, if adhered to, all this can be achieved by anyone and everyone if they are serious about changing their life for the better. Whatever their reasons for embarking on the programme the results achieved by members exceeded their expectations and quality of life has been dramatically enhanced, seeing improvement in not just physical wellbeing but also their mental attitude to life in general. Some of these diseases we are told are incurable, chronic and degenerative, we accept medical opinions as fact but what if they aren’t. What if regaining health could be as simple as just giving your body what it requires and not what it doesn’t, eliminating as many pollutants, toxins, allergens etc. from being ingested as possible and allowing the ‘complex machine’ that is our body attempt to heal itself ‘naturally’. It must be worth a try, what have you got to lose, except maybe a few extra pounds of excess weight? Sign up today to begin your Transformation. It is estimated that 90% of Disease is Lifestyle Related. ‘Lifestyle Disease’ a Disease associated with the way a person Lives. The most common causes of Lifestyle Diseases are Poor Lifestyle Choices such as Smoking, Overuse of Alcohol, Poor Diet and Physical Inactivity. Poor Lifestyle Choices will catch up with us all in the end. Disclaimer: we advise that you seek professional medical advice before doing any exercise or dietary programme. Health Transformers accepts no liability for any health issues resulting from participating in this programme.